The following paper takes a widespread look at automated enforcement systems, specifically red-light cameras (RLC) and automated speed enforcement (ASE) systems. Initially exploring the detrimental consequences of drivers running red lights and speeding, the paper will define automated enforcement systems, the impact these systems have, the issues they raise, the question of legality and the ongoing battle of public perception. 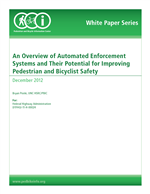 Using this information, it will explore the implications that automated enforcement systems can have on pedestrian and bicycle safety. The final section discusses how automated enforcement systems should be seen as one potential tool to aid crash prevention, rather than a comprehensive and final solution. It also cautions against the implementation of automated enforcement systems primarily for the generation of revenue. Seeing the systems as part of a broader campaign to make streets and intersections safer is the best way to prevent legal challenges, and garner public support, so automated systems can achieve their intended purpose of preventing traffic crashes and saving lives. Prepared by Bryan Poole in December 2012, and updated by Sarah Johnson and Libby Thomas (UNC Highway Safety Research Center) in December 2017.